This entry was posted in Personal Reflection and tagged Body Pump, Exercise, Fitness, Group Fitness, Health, Les Mills, workout by MichelleK. Bookmark the permalink. 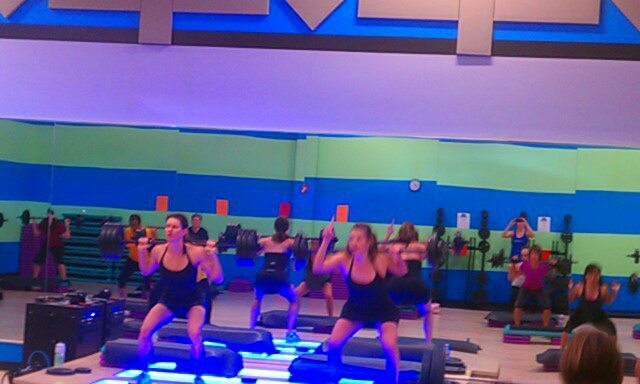 Wow, that is really cool that you’re leading you own Body Pump class! I haven’t been for a long time but I really enjoy this class. I think it’s really led to many women not being scared of weights and being interested in strength conditioning. I had no idea the process to qualify to become an instructor would be so tough. Well done on qualifying and I hope your class goes from strength to strength! Wow! Love this post! I now have mad respect for Les Mills instructors. Sounds pretty tough to finally get certified! Yes, I take the Body Pump and I have tried Body Combat once. I think Body Pump still has to be my favorite! Combat is fun, but I get crossed up. Mad props to those who teach it 🙂 I think the Combatters I know are the most gung-ho of all the LM instructors. I have been seriously considering becoming a fitness instructor for over a year now. I have been researching all day about BodyPump certification and can’t stop thinking about it!I love attending Group Exercise classes of all types but I am afraid that I am too shy or serious to teach. I am very comfortable with BodyPump moves and format and I love learning about fitness and nutrition and teaching others. I feel like it is something I just need to push myself to try. Anyway, thank you for the honest post. It sounds very daunting but at the same time I am hoping it provides the personal growth and confidence I really need! Go for it! It’s good that you are already familiar with it. As I mentioned, I hadn’t taken too many classes before I decided to try it. Thank you so much for writing this. I just went through certification 6 weeks ago and will be filming in 2 days. I went for a demo today with a gym and was told, thanks, but not now, go work on your timing and come back. Everything else is perfect, but…… I was crushed today and ready to throw in the towel. I appreciated reading this. Thanks for the comment, Mona. It’s a hard process and a sometimes heart-crushing one. I think the good news is your case is that timing is very objective and you should be able to nail it with practice. I’ve been taking body pump for 2.5 years now and am seriously thinking about become an instructor since it’s something I do and love anyways! Thanks so much for your experience. That took a lot of courage to write it all down. I am very coordinated (can catch on easier to zumba and advanced step moves quickly) and many of the regulars I workout with have said that I need to teach because I put in 150% and am high energy. Was it nerve wrecking to be in front of the class? How does it feel now? If you have a passion for it, I definitely think you should give it a go! It is a lot of work when you are starting out and you have to really want to do it. It’s still work now, but I pick up most of the new tracks pretty easily and have a good libarary of cues tucked away in my head. It was hard teaching in front of people at first, and I’d get really nervous. I don’t really anymore, although when I sub a class I will feel it a little. You get comfortable putting it all together after a while and it helps to get to know the people in your class. Thanks for sharing your experience. I have signed up for initial training in May, so I am scouring the internet for tips, etc. I did Les Mill Pump DVDs (via BeachBody) at home for several months, then got my AFAA group fitness certification and started teaching a variety of freestyle cardio and muscle classes about 10 months ago. Teaching Bodypump is my dream. I am nervous and excited about the certification process. Congrats on teaching your Bodypump classes three times a week! That’s awesome! What is your style of teaching that they didn’t appreciate? Was she specific? I’m curious to know what people do or don’t like. I just went through training and am going to tape my video this week. Besides pointing out a few choreography errors here and there (that I just accidentally messed up), no one really gives me any useful feedback about style. Let me know what your style is now, and what about it back then wasn’t “good enough” for that other place. Thank you so much! And congrats! Hi, Liza. Thanks for commenting. Some of the comments was that I was fake and lacking energy. Everyone has their own natural style, of course. And different people will always be attracted to different personality styles. I am sure that I am not everyone’s cup of tea, but I think that some people genuinely enjoy my classes, so that makes me feel good. I also think that the *most* important thing is to clearly present to chory, because that and the music do most of the “heavy lifting” in making class enjoyable. Giving people notice of what’s coming, how many reps are left, good form cues, and explaining why we are giving these cues, so they have a safe, effective, and challenging workout will make them want to come back. Thanks for sharing. Very often, the best learning and teaching opportunities are in your local gym. That’s exactly how I got my foot in the door. I train in a small studio now and love the small group environment. There is a lot more interaction and exchange than with very, very large classes (which, nonetheless, offer a different kind of challenge). Great details in your post about the certification process, and the ups and downs of trying to become an instructor. I just filmed my first video thinking I did great….and then I watched it! Oh no there were so many mistakes in execution, technique, camera angle, there’s no way I can send it in if I want to pass. Good to know what areas they are grading you on, and that a 4/5 is not a total fail and resubmit. Congrats on getting through it all and becoming an official Les Mills Bodypump Instructor! Really appreciate this post. I’ve signed up for the audition in May at a Goodlife Club and this gave me a better idea of what to expect. I’m at the very beginning of the process and it’s a little nerve wrecking, but just like with everything, the more you do, the better you’ll get. Thanks! Thanks for stopping by and commenting. Expect lots of feedback, which can be overwhelming, but keep working on it 🙂 Best of luck! Hi great post! I’m thinking of becoming a Body Pump instructor too. I find instructors that cue well are the best ones and that must take some serious focus. I feel that would be the most challenging part especially when you’re really nervous. Do you have any suggestions/tips or little tricks on how to best do that? I’ll probably take the training in a few months so I really want to be prepared. I have been taking body pump for about 3 years but I have never taught anything. I’m just such a dork about body pump that I feel I should go for it. Also because going through the training and teaching scares me and so I need to do that scary awesome thing I want so I can grow. It’s definitely outside my comfort zone. Reading your experience is super helpful! Dealing with the nerves? Only time 🙂 And knowing the material. Spend lots of time with it. Knowing the choreography is like laying the foundation. Know what’s coming so you can pre-cue and maybe throw out some spontaneous comments. If you’re struggling to remember what comes next, everything falls apart. Granted, brain farts happen, but when you know the music you can recover. Good luck! If you love Pump, you’ll love the training and love being an instructor. How much did you make at your first job? I’ve been wanting to do this forever but just found out that the training is quite expensive so as a broke college student I want to be sure the payout is worth it. $300 out of my bank account would be a significant amount sadly. The gyms I teach at in AZ pay $18-$19 a class, but the clubs in your area may be different. I also get free memberships, which is nice. You will also be required to buy the new release every three months, and that runs about $35. There may be some leeway on that if you don’t have a regular class, but I think if you go over a year without getting the new release, you need to go to another training and do a re-sit. Things may have changed, but I just mention that there are some ongoing considerations even after training. Was it difficult to memorize the choreography? I’ve attended 100s of bodypump classes and that’s the biggest barrier/anxiety I have to becoming an instructor. Wow. What a story. Soon I will go to Hudson Florida for attending a class training on Pump. I am from Puerto Rico and my English is not very good but this is my dream. Soon Les Mills will send to all what is going to be our tracks. I do not know of course what will be mine. So.. hope they aprove my English on both days ( Jun 9 and 10). Good luck, Pedro! I hope your training goes well. I think you should be OK as long as you can name the muscles and describe how people should be moving. This is awesome. Love your story. I’m looking at starting my journey out as a pump instructor and just doing some research and reading about other peoples experience is motivating me to push the button to book onto the two day instructor training. What I want to know if most people that go through this, are they ordinary every day people who love fitness and love pump, or are most people super fit personal trainers already who just want to expand what they do to? I’ve been doing pump on and off for years, and have recently got back into it in the past year and loving it, I am also regular gym goer, and enjoy getting outdoors on my bicycle etc, but I wouldn’t say I fit into the super skinny / super fit looking category and this worries me. What are your thoughts having done the training? Also, did you have any previous group exercise qualifications beforehand, if so, do you think it helps? If not, do you think it would be worthwhile doing? Hi, Magz! I’d say there’s a mixture of “everyday” and “super fit” people who teach Pump. It is important to be in good shape (able to teach the class with good form using “role model” weight), but not at all necessary to look like a fitness model. It sounds like you would be fine. I did not have any certifications before Pump (I now have RPM as well). I’m sure having one would only help, but since you are not designing the program, it’s not necessary. In training, you will spend a lot of time working on (and getting critiqued on) form so you can lead the class well and help cue participants who need adjustments. If you love it, you should definitely go for it, assuming you have the time and money. Expect to work hard, especially at first when picking up the choreography is though, but it will get easier. Good luck! I asked the role model question on an instructor forum, and while it is a term I heard in training, there isn’t a set minimum. I think you should be fine if you squat those weights. I trained in 2008, and the releases the past couple years have been much more pulse-focused, so I have to lift less than I would if I were doing older releases. It also seems like the concept of role model weight is less of an issue in training. That said, while you should not be maxing out when teaching (you need to talk and demo good form and complete the reps), it should still be a workout. If you’re cruising through with light weights, it’s not really motivating your participants to push themselves. Also, I think as an instructor, while you might not be the strongest in the class, you should at least be able to lift as much as the average participant unless you have an injury or something that prevents it. Good luck with training and I am happy to answer any more questions you have.